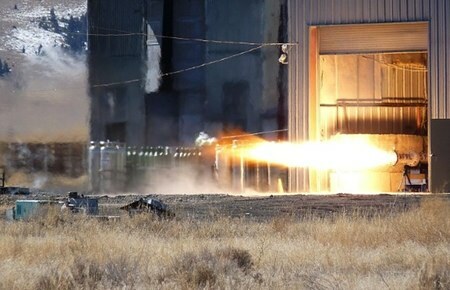 When you think of hybrid engines, what typically comes to mind is the hybrid rocket motor developed for SpaceShipOne that powered it to the $10-million Ansari X PRIZE in 2004, and its larger successor, RocketMotorTwo, under development today for SpaceShipTwo. Both those hybrid motors use a combination of liquid nitrous oxide and solid hydroxyl-terminated polybutadiene (HTPB) as propellants. Beyond that application, though, hybrids have seen little use in launch systems. The key difference between SPG’s motor and other hybrids is the choice of propellants. SPG uses liquid oxygen for its oxidizer and paraffin for its solid fuel. This retains a key advantage of hybrids—safety—but offers solutions to a couple of issues with more convention hybrids. One such issue is their low “regression rate”, or the rate at which solid fuel burns away. This requires some complex designs for the fuel in order to increase the surface area of the fuel exposed to the oxidizer. These designs include some intricate “wagon wheel” geometries that can create some issues of their own regarding the structural stability of the motor as it burns, including chunks of fuel coming loose. Replacing HTBP with paraffin eliminates this problem, Karabeyoglu said, because it has a much higher regression rate. The “wagon wheel” and other complex designs can be replaced with a simple, single port down the middle of the motor. He said they have also tweaked the design of the motor to address low-frequency instabilities, another issue with hybrids. Using paraffin also has cost advantages. “The advantage of the paraffin is that it’s dirt cheap,” Karabeyoglu said. “You can’t find anything cheaper than that. It’s actually less expensive than gasoline.” They buy ordinary paraffin in bulk from candle suppliers and cast it into cylindrical motors in a relatively simple process at their facility, located in a nondescript industrial park just off the 101 Freeway in the heart of Silicon Valley. Work on the LOX-paraffin motor, including some earlier, smaller 25-centimeter (10-inch) designs, has been funded in part by the Air Force through SBIR awards. With the upcoming tests of the 22-inch motor, SPG hopes to demonstrate the capabilities of this alternative approach to hybrids and open up some opportunities for future business. The company has already looked at using this motor as part of an air-launch system as well as a ground-launched smallsat launcher that could place 100 kilograms into LEO for $2.5 million.